1) Tonight and tomorrow we will have Student Led Conferences. If you are signed up please bring your child with you as they will be leading the conference. 2) There is no school for students tomorrow due to conferences. 3) Friday is dress like your favorite book character day. Students are encouraged to dress like a book character and bring in a book with that character. We will be doing activities focused on the book and character on Friday. 4) Next Wednesday we will be celebrating the class participation in the Yankee Candle Fundraiser. We will have a class one minute talent show in the classroom. Students are encouraged to think of a talent they would like to share with their classmates. Due to the fact that we will be doing this in the classroom we are limiting our audience to just the students in the class. 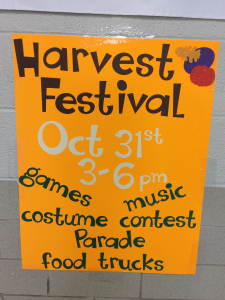 5) Remember that this Saturday is the PTO Harvest Festival here at Heritage. The PTO has been working very hard on the event and it is sure to be a wonderful time! We are working hard in class and have so much going on. We have started a new book in Language Arts, Sarah Plain and Tall. This is one of our stories that is “Inspired by the Sea” and is a favorite of the kids every year. We are working on using text evidence to answer questions, telling stories from first person point of view, and identifying character traits. We will work on publishing our narrative writing this week as well. In math we are adding and subtracting within units of measure. Social studies will be focused on the history of Pickerington. We have Stanford testing every day this week. Please try to make sure that your child is in school and on time so that they are able to take the test with the class. Tomorrow (Tuesday) is a 2 hour delay day for teacher professional development. Thursday is the first day for Conferences. We are doing Student Led conferences this year so please make sure your child is in attendance. There is no spelling this week due to Stanford Testing. Please make sure that Reading Logs are coming in on Mondays. We have had several students that have had them missing recently. STMath fluency should be done each night. The Heritage Harvest Festival is being held on October 31st from 3:00 – 6:00 PM. There will be live music, food trucks, and games planned for the day. There will also be a costume parade and costume contest. They are still in need of volunteers, if you can help please click the link below. This week we read a great friendship book that is inspired by the sea. The story of Amos and Boris is a wonderful story of unlikely friends and how they help to save each other’s lives. This story is also full of rich vocabulary and gave us six more million dollar words! The words are below. Try and use them with your child this week. necessities: what you really need. Have a great weekend! Enjoy your time as a family! We have been working hard learning some new million dollar words here in the 3rd grade. We are up to a total of 24 words so far this year, and the list will keep growing. Here are the words we are focusing on for the next week. Try and use these words at home this week with your child and encourage them to use them too! Have a great weekend!